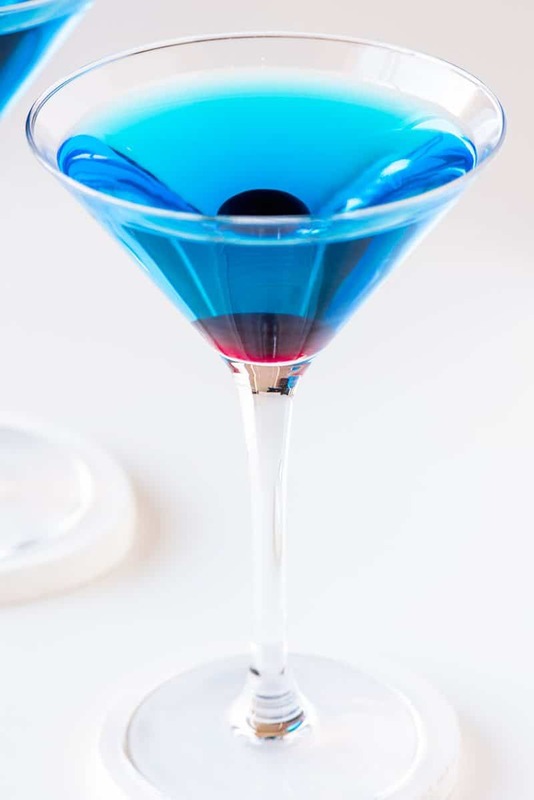 This vibrant blue drink is the perfect fit for any color-themed party or event. 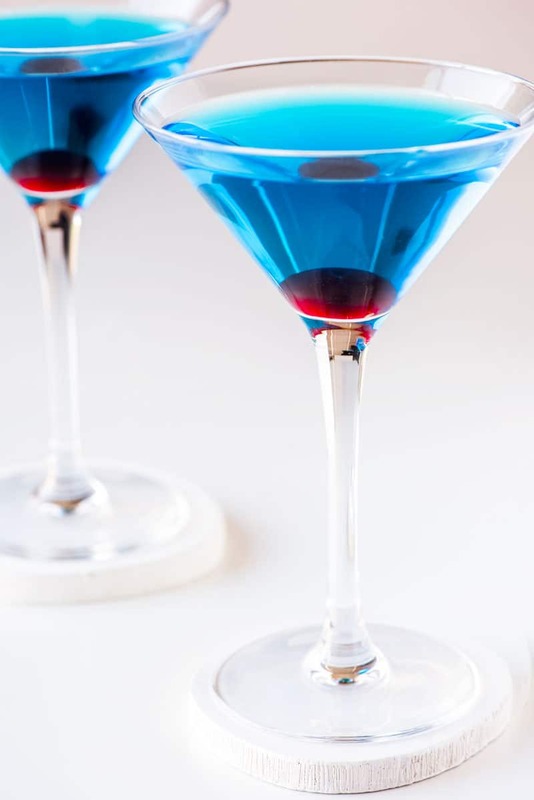 With its citrus taste and fun garnishes, this sapphire martini is a fun and easy addition to any drink lineup and is sure to be a hit with all of your guests. Everyone loves a pretty party drink, and there are few as vibrant (or as easy!) as a blue sapphire martini. As fans of this drink already know, this drink is best when it has a simple presentation. 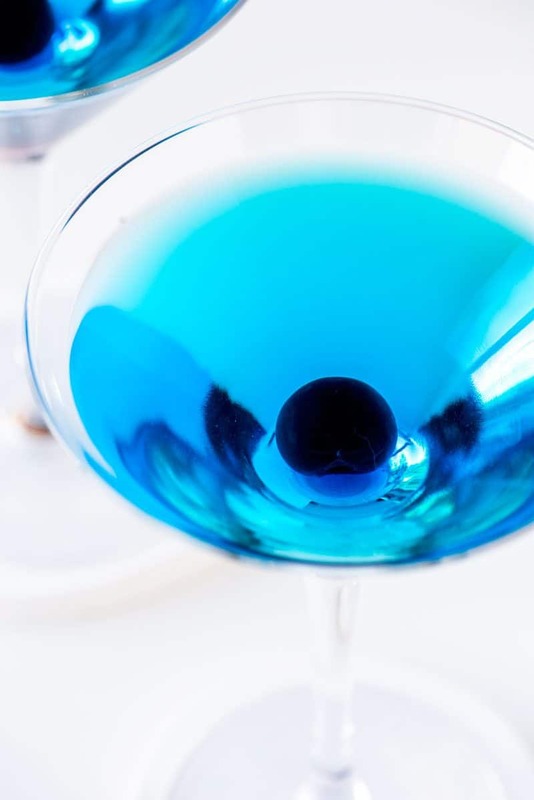 Garnishes tend to be simple, with either a single lemon twist, orange twist, or a maraschino cherry dropped in the bottom of the glass (as pictured). However, if you wanted to go all out and coat the rim with white or blue sanding sugar, I’m certain no one would complain. This drink is a great fit for any color-themed party, too. It’s bright blue hue is ideal for any winter holiday, a favorite sports team, or even certain movies. What is in a sapphire martini? You can easily use your favorite dry gin for this drink – and, honestly, that’s exactly what I do. I like to stock my bar with the essentials that will work with a wide variety of drinks and a standard gin fits this bill. However, you will find some purists who will insist on using Bombay Sapphire Gin, and the reasoning is obvious: the bottle carries the same sapphire hue that makes this mixed drink so appealing. That color is only on the bottle, however, and not the gin itself, which is actually clear, just like any other gin. But like any specific alcohol brand, Bombay Sapphire Gin comes with its own hints and flavors. Check out this review of Bombay Sapphire Gin to see if it’d be a good fit for your pallet (and your bar). Ah, blue curacao. Truth be told this is one of my favorite liqueurs, simply because of how many pretty drinks you can make with it. Made from the peels of the laraha citrus fruit, it has a sweet (and slightly bitter) citrusy taste that blends well will with both sharp and sweeter flavors. Why would a citrus liqueur be blue? That’s an excellent question, and a bit of a hard one to answer. Like all stories, it has something to do with the source of the liqueur, but the origins are a bit murky. If you’re curious, you can read more about the origins of blue curacao here. 3 – Dry Vermouth (optional). You’ll sometimes see dry vermouth added to this martini, but I’m not a fan. Vermouth brings with it the taste of herbs, roots, bark, flowers and other botanicals, and I think it brings down the overall flavor of this drink. So if you want something light and citrus, skip the vermouth. However, if all of those deep flavors sound appealing to you, just add a few dashes to your cocktail shaker. 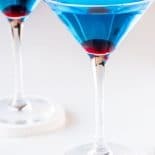 This can sometimes be a little confusing, but I’ve found the best way to think of it as this: Recipes that measure in parts usually mean it’s written so that you can adjust the size of the martini to whatever you want but still keep the ratio of the ingredients correct. Using this method, the drink will taste the same no matter what size you make it. As mentioned above, you can garnish this drink with a twist of lemon or orange, a slice of lemon or orange, or a single maraschino cherry. I like the look of dropping a maraschino cherry in the martini glass because it creates a pretty red hue near the bottom of the drink when viewed from the side (as pictured). Like most mixed drinks, you’ll need a trusty cocktail shaker to make this blue cocktail. I use a Mason Jar and Stainless Steel Cocktail Shaker Set that has a rustic look that’s fun for parties. If you already have a ton of mason jars and just need a cocktail shaker lid, you can pick up on here: Mason Jar Cocktail Shaker Lid. In a cocktail shaker filled with ice, add gin, blue curacao, and dry vermouth (optional). Shake vigorously until combined. Strain sapphire martini into a martini glass. Garnish with lemon, orange, or a maraschino cherry. As an avid gin drinker, I can assure you that actual Bombay Sapphire Gin has no, as in zip, zero, nada, color to it. Only the bottle is a beautiful, delicate blue. The gin itself is as colorless as plain, old vodka. That said, your recipe is tasty, I like my gin with nice citrus notes. SO pretty. I’ve never had one of these before – and I love gin! A must make!! Gin is my favorite and I can’t wait to try this drink out! Especially since I already have both ingredients!